Dozens of vinyl Donald Trump stars appeared on the Hollywood Walk of Fame Thursday morning, according to a published report. 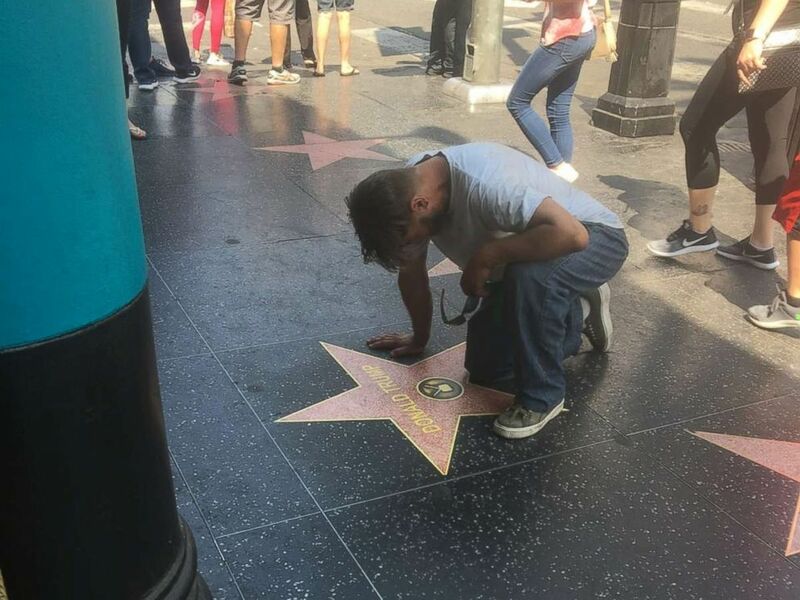 The President’s real star has been vandalized several times, being destroyed with a pickaxe two weeks ago. Thursday’s star multiplication can be attributed to an anonymous conservative street artist, according to The Hollywood Reporter. He told the publication he was motivated by both the destruction of the real star as well as the city of West Hollywood’s vote for the star's removal. Dozens of vinyl stars for Donald Trump were placed on the Hollywood Walk of Fame on Friday, Aug. 10, 2018. This eye-catching demonstration on one of Hollywood’s most famous streets comes just days after the city of West Hollywood unanimously voted on Monday to remove the President’s star, noting costly vandalism. West Hollywood City Council members said they brought forth this proposal in response to the president’s treatment of women and views on climate change. 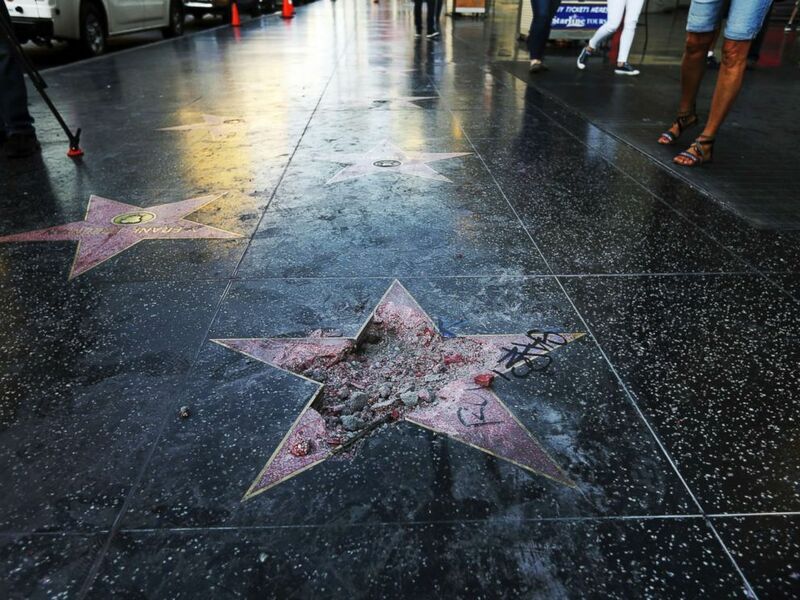 The damage done to Donald Trump's star on the Hollywood Walk of Fame that was vandalized, July 25, 2018, in Los Angeles. Authorities said a pickax was used in the vandalism. Vinyl stars were placed in blank spots open for future stars, including an area in front of Ripley's Believe It or Not! store. General Manager, Cory Dacy, told ABC News that the Trump stars appeared quickly and discretely ar0und 10:00 am. The Hollywood Reporter noted that the star-installation crew kept the stars covered until they were all secured in place, so that spectators would not catch on to what was happening. 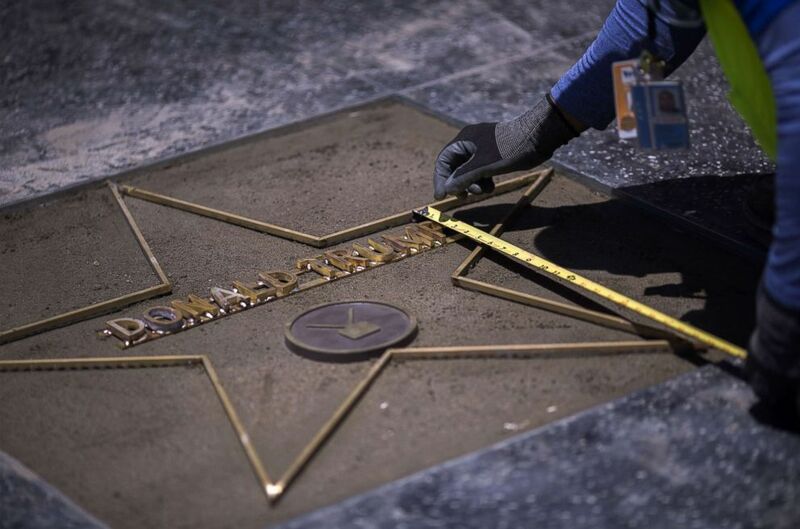 Workers replace the Star of President Donald Trump on the Hollywood Walk of Fame after it was destroyed by a vandal in the early morning hours on July 25, 2018 in Los Angeles, California. The star placed in the Ripley’s doorway attracted much attention, and was soon removed by an employee. Dacy said the rest of the stars were gone within the hour. However, it seems the anonymous artist’s mission may not be over yet. “The Faction” says that they will further spread "Trump Derangement Syndrome" -- – a fictionalized term first used by Trump to "diagnose" critics of his summit with President Vladimir Putin, and one further used by right-wing media outlets and supporters to describe critiques of the president –- by installing a never-ending stream of stars.